For months now, we have been teased about a T-Mobile branded Samsung GALAXY Note. Just the other day we even saw the phablet on a T-Mobile poster which has to be a positive sign for all of those T-Mobile customers who have been patiently waiting for the arrival of the phablet. For all of the rumors circulating the Samsung GALAXY Note and T-Mobile, we never actually heard anything about a launch date, even as a rumor. But now T-Mobile has put the device up on its support site, which tells us that the launch of the device could be extremely soon. 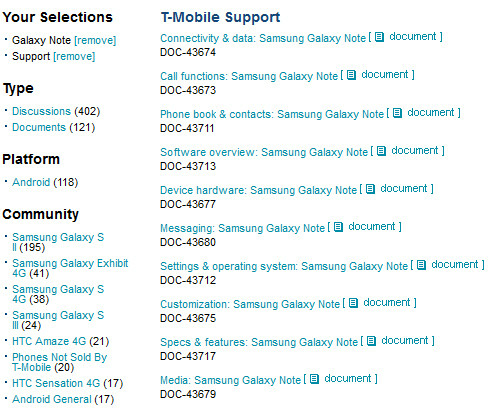 The support site lists a number of documents available for the device including messaging, hardware, specs and features, etc. Unfortunately, you cannot access them for the time being. You normally wouldn't expect to see a support site put up for an unannounced device, unless that device was on the verge of being launched. Getting excited T-Mobile customers? I'm not surprised that T-Mobile wants the Note, but with the Note 2 coming out in just a few weeks, WHY would ANYONE want to buy the out-dated version? Is it going to be 30% of its original $250 subsidized price? Reduced usage charges? WHY? Right. They're too late. If i would have a phone with contract, i rather have the latest one. 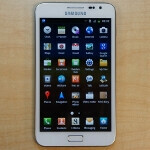 Galaxy Note is not a cool smartphone like Galaxy S3, most people preferred S3 over the Note because it is easy carry. I just want to use as tablet. I ride the bus everyday and it's the PERFECT size. If I can get this for 140(ish) I would be stoked!! I prefer note over s3. Given the fact that it's almost a year since it was introduced, it still is a topnotch phone. A phablet is perfect for people who wants a tablet on the go that goes with a phone...Seriously, it's perfect. And rumors about note 2, it will be way better than s3. isn't that a bit too late because note 2 is coming soon. Too late. Pulled the trigger yesterday for the white GS3. Don't regret it a single second. Why would anyone chose the note over the GS3? It'll have to be priced really well. Who the hell keeps going into every article thumbing down every comment? I mean seriously get a life.